Skiing and Snowboarding have been a favorite pastime amongst all ages since the first wooden ski was strapped to a boot, or two skis together in the case of the first snowboard - AKA- the Snurfer. Technology in snow skis and snowboards have come along way but the desire to hit the slopes for some fresh powder or to carve up terrain park under the sun remains a constant emotion for many. breathtaking Central Oregon vistas. Do not forget your camera! The snowboarders of the group will love this next part. Mt Bachelor features 5 terrain parks and 2 half pipes, one of which is a 400 foot super pipe with 18' walls. This snowboarding super pipe is among the best in North America and hosted the 2006 USSA Olympic Qualifier. If you do not want to be confined by a man made terrain park then hop on a ski lift and explore the rest of Mt Bachelor. Natural high desert terrain is only one lift away and is ready to captivate your mind and engage your senses. 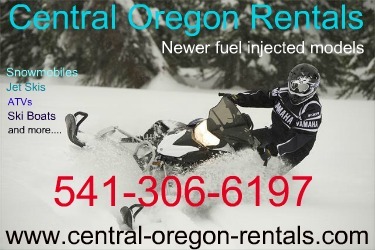 Whether your skiing or snowboarding, Central Oregon and Mt Bachelor are here to please. Two tubing lifts for family fun and two beginner areas for first time skiers round out the lift ammenities. Other features at Mt Bachelor include Nordic skiing (XC skiing), dogsledding, snowshoeing, interpretive tours and snow-tubing. Seven restaurants, three bars, and three coffeehouses on the premises are throughout four day lodges. Additional accommodations and lodging are nearby in Sunriver and in the city of Bend. Come join us for some dry powdery snow and sunny weather! mt. bach parks, edit one from Troy Costa | Unified Productions on Vimeo. Mt Bachelor Pow Session 1/17/12 from Wide Open Tour on Vimeo. Kent Callister Yo Beat Gatorade FreeFlow vid from brett callister on Vimeo.